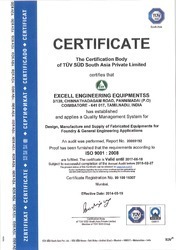 Established in the year 2001, Excell Engineering Equipmentss, is recognized amongst the prominent manufacturer and supplier of Process Handling Equipment, Engineering Equipment Parts and Sand Preparation Equipment. 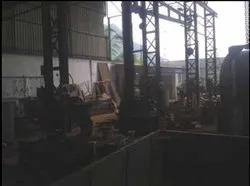 Apart from this, we also offer Intensive Sand Mixers, Sand Mix Muller, Cast Iron Pallet Car, Molten Metal Handling Equipment, SG Treatment Ladle, Tea Spout Ladle with Handler, Fettling Machines, Pedestal Grinders, Swing Grinding Machine, Swing Frame Grinder (Special Type), Knockout Machine, Shake Out Grid, Pneumatic Transporter, Chain Conveyors, Belt Conveyor, Vent Filter, Dust Collector, Ladle Pre Heater - Horizontal Type, Pumping Unit (Diesel Firing System). These are highly appreciated by our clients due to their application specific design, enhanced functionality and durability. Quality is our trademark and we make sure that we provide only superior range to our clients. This is why; we fabricate our equipment utilizing high grade material and test on certain parameters before sending these to the clients. Along with the quality of the products, prompt delivery of the products is also important. We have set up a state-of-the-art infrastructure that helps us in meeting the bulk requirements of our clients within the stipulated time frame. Our organization was founded by Mr. C. Nandakumar, who acquires a rich industry experience. Under his able guidance we have carved a niche for ourselves in the industry and have gained high reputation in the market. 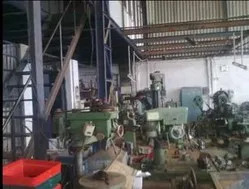 Manufacturing and Trading of Engineering Equipment. We offer a wide range of Process Handling Equipment, Engineering Equipment Parts, and Sand Preparation Equipment. 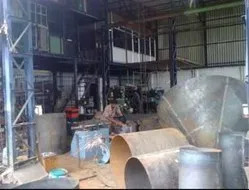 Apart from this, we also offer Mold Handling Equipment, Molten Metal Handling Equipment and Fettling Equipment. These are manufactured using high grade material that is procured from reliable vendors to ensure their high performance & durability. Our range is widely used in various industries such as automobile, automation, electronic & electrical and pharmaceutical. 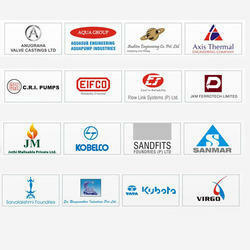 Furthermore, we also customize our range to meet the specific requirements of our clients. Our Company is An ISO 9001:2008 Certified. We believe that to cater to the growing demand of our clients, we require to remain updated about the latest market trends. Our R&D department strives hard to offer innovative and better quality products. They ensure that we are well-equipped with latest methodologies and technology that would help us to keep pace with the changing market scenario. Our R & D professionals constantly carry out research works to develop newer and improved manufacturing techniques that would yield optimal output. Separate fund for this department has been allocated to allow them to carry extensive research smoothly that might lead to productive results.